Dr. Pat Davidson is truly a renaissance man. With a Ph.D. in exercise physiology and a career in strongman, the guy has pushed the limits both physically and mentally. But most importantly, he’s a guy that I always love chatting with, because he’s always thinking about the training process, and how to get the most out of the human body. 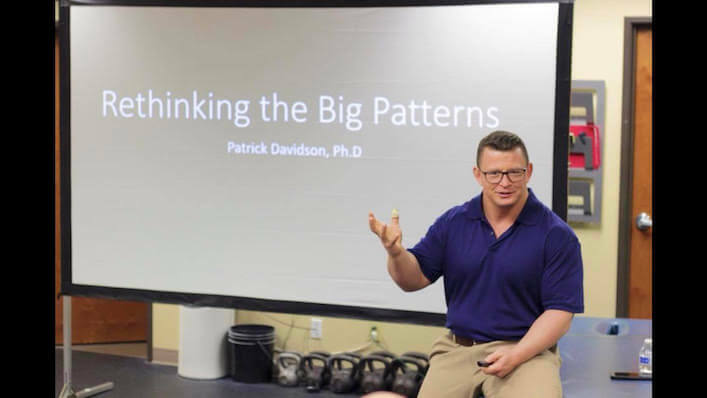 In this show, Pat and I talk about what a training taxonomy is, and why you should be developing one, why you should seek out your “rate limiters” when it comes to training, and a ton of practical tidbits on cuing to help you get more out of big lifts like the squat and deadlift. This show is an awesome blend of theory and application, and I know you’re going to love it. A little bit about Pat, and what he’s been up to since our last podcast. Taxonomy: What it is, and why you should be developing one with your training. How Pat groups his exercises and classifies them. The various stances he uses with his clients and athletes, and why you need a mix of them in your training. A ton of practical cues for exercises like the squat and deadlift, as well as positions like tall- and half-kneeling.